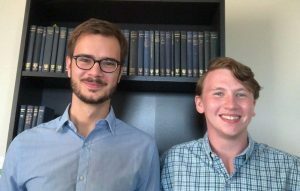 Two new students have joined the PhD program in Classics: Yanneck Wiegers (left) and Connor Sedlacek (right). Sedlacek received his B.A. from the Gallatin School at NYU and has been teaching for a couple of years at the Pierrepont School in Connecticut. His interests include the role of the classical tradition in eighteenth and nineteenth-century German thought and literature. Wiegers comes to us with a B.A. from Osnabrück University and a Masters degree from the University of Leipzig, as well as a term of study at the Scuola Normale Superiore in Pisa. His primary interests are in Latin poetry (Augustan and pastoral).